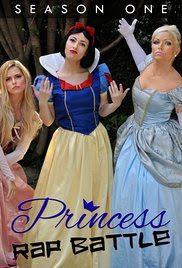 Princess Rap Battle, the brain child of Whitney Avalon features strong female characters battling it out with rap songs. There is a whole series of these short videos, but I just picked my three favorites to share with you. Some of the lyrics are explicit, so you may want to watch first to see if it's something you want to share with children. First up, we have Cinderella vs. Belle, and Sarah Michelle Geller plays Cinderella. Here are the lyrics in case you want to sing along. They are brilliant. Next up is Katniss Everdeen vs. Herminone Granger. And last we have those dragon lovers, Maleficent vs. Daenerys. Who would you like to see rap battle? I bet these actresses had so much fun doing this. They're hilarious. You can tell that they are having so much fun. There's a new one debuting this Wednesday. I can't wait to see it.